As the weather in Phoenix finally begins to cool off, homeowners are enjoying more dinners outdoors. This pleasant weather makes fall the perfect time gather with family and friends for a night of fun and homemade pizza from your UNIQUE wood-burning pizza oven. Nothing can beat the old world taste of a fresh pizza or the fun of customizing your pie. Each pizza oven is custom built to meet your needs and the décor of your outdoor kitchen or BBQ area. We recommend considering an oven that is at least 32” to 36” as this will provide the fastest and most efficient heating of the oven. This size unit will accommodate 2 pizza of about 10” each and will cook in just a short time. 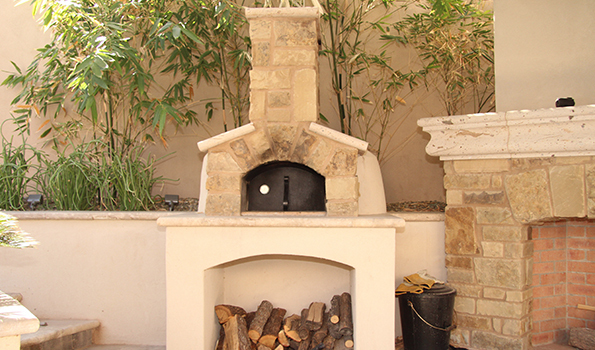 The exterior of your wood-burning pizza oven can be finished with stone, tile or brick to Your UNIQUE designer will be able to make suggestions about the style of the oven as well as the perfect location in your yard for ease of use and safety. With your selections made, then you can leave everything in the capable hands of the professionals at the Unique Companies. Each step of the construction process is completed by skilled the tradesmen who work for UNIQUE. There will be no subcontractors on your property and you will have a single point of contact at UNIQUE who can answer any of your questions about anything from the design of your pizza oven to the construction or care of the oven. There are many landscapers, masons, designers and pool companies in the Phoenix area, but the UNIQUE Companies are the only complete outdoor living space contractors. 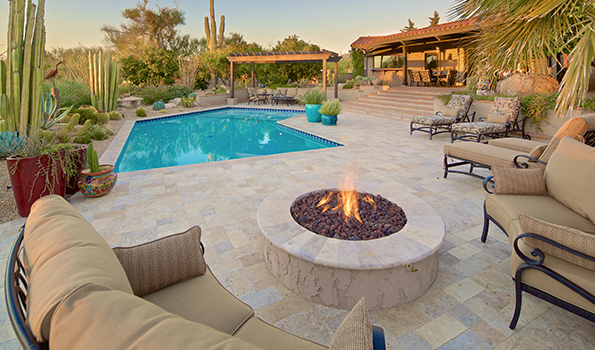 With three licenses from the Arizona Registrar of Contractors, UNIQUE is not only qualified to build pools and landscape but the company also holds a general contractors license, so no project is too big for the UNIQUE team. Call today to schedule a free consultation with a UNIQUE designer and have your wood-burning pizza oven completed before the holidays. Kids love to begin Halloween decorating as soon as fall arrives, but the heat is still on in Phoenix, which means carved pumpkins will only survive a short time. But there is a simple solution that will let your kids start decorating with real pumpkins right away. Rather than carving pumpkins let your kids get creative decorating pumpkins. This can be as simple as using spray paint and a few leaves as stencils to create a fall look or as complex as actually painting a full jack o lantern face on the outside of a pumpkin. The secret is simply to be careful not to cut or damage the outside of the pumpkin during the decorating process. For some added flair to satisfy even the most creative children, sprinkle the pumpkin with glitter while the paint is still wet. Sequins, paper leaves, and even stickers can also be used to create a customized pumpkin that will not begin to shrivel in the heat of the Phoenix fall. Then, about a week before Halloween, you can encourage your kids to carve their pumpkin and get it ready to illuminate the path for trick or treaters. If your children don’t want to ruin their artistic pumpkins by carving them, then they can clean out the inside and carefully drill or cut small holes throughout the pumpkin to create a filigree look when a candle is added. 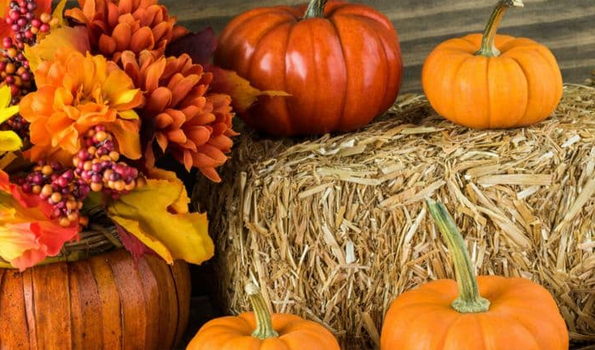 Try this UNIQUE tip, and your family can enjoy having these great fall decorations without worrying about sunlight and heat turning your children’s holiday decorations into a pile of orange mush long before Halloween even arrives.